Online music shop Synnara unveiled the contents of EXO‘s upcoming studio album EXODUS, sharing in detail that the group’s new album will be available in 20 different versions! There is high anticipation for this album as their first album XOXO (2013) became their first official album to break the 100,000 copies sold, further solidifying their status as a top group in Korea so soon after their debut in 2011. With their second album drop date nearing, it’s not surprising that many are expecting another EXO syndrome to take over the music industry again. EXODUS will feature 10 tracks in total including their title song “Call Me Baby.” In preparation for this comeback, the idol group has gotten fans’ curiosity working overtime as they unleashed “Pathcode” teasers, for which the answer will allow them to unlock concept photos from the group’s special promotional site. Of course, EXODUS will be available in both a Korean and Chinese edition, but goes even further than that. Both the Korean and Chinese editions of the album — available in gold and silver respectively — will be available in 10 different versions each with a different member gracing the album’s cover. When placed together in a set, the spines of the albums unveil EXO’s logo to relay its completion as a collection. 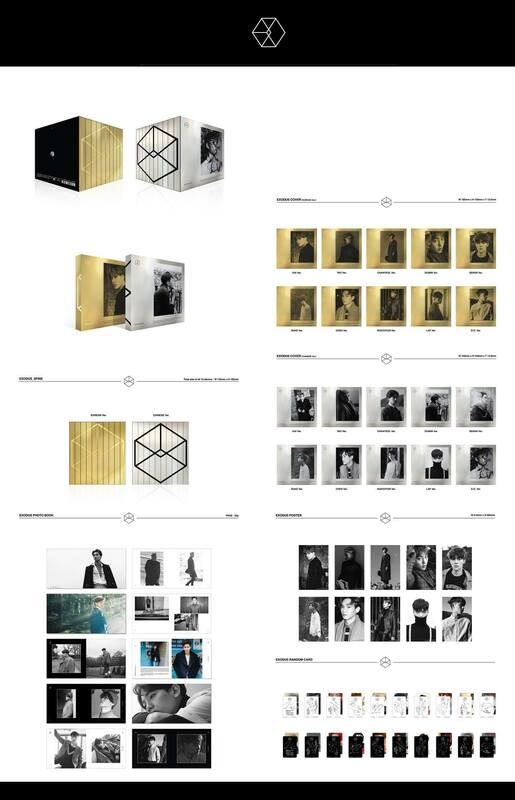 The album will also feature a photobook booklet of 52 pages, mixed with the lyrics and thank yous for the EXO members. A poster is available for each members, and a random photo card will be given with a copy of their respective signatures on the back. Eleven months after the release of their last mini-album Overdose, popular male idol group EXO will finally be returning with their 2nd studio album EXODUS set to be released on March 30th, which will be followed by their very first comeback stage on Mnet M! Countdown on April 2nd.